Port Elizabeth has had the misfortune to suffer from periodic devastating floods. Our ancient forefathers would have attributed this to displeasing the Gods in some way or the other, normally by being sinful. With the benefit of science, this phenomenon can surely be attributed to the fact that Port Elizabeth is at the confluence of two weather systems, periodically introducing extreme weather. As the most devastating floods, as well as many of the worst south-easters, occurred during the three months September to November, it can safely be assumed that weather patterns as opposed to vexatious gods, is the culprit for this flooding. This blog only covers the significant floods until November 1908. 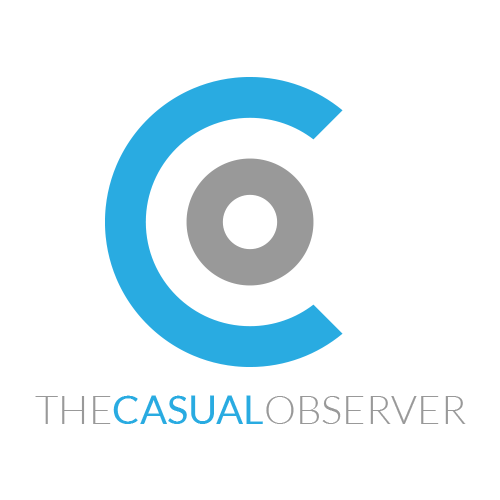 This was the first devastating flood in Port Elizabeth since the arrival of the Settlers. Heavy rain over two days – 30th September and 1st October 1847 – swept away both bridges over the Baakens River. The streets up Donkin and Chapel Hill were torn up. In order to rebuild the bridges over the Baakens, a Subscription List was opened. What exacerbated the extent of the flooding in this instance was the fact that it had been raining steadily before the 1st November 1857. By then, the ground of the watershed of the Baakens River was already saturated. On the evening of the 31st October, it commenced raining heavily and continued without respite right throughout the next day. This was the tipping point. With the ground already saturated, every additional drop of rain just flowed straight down into the river. rose steadily and the pressure on the newly reconstructed bridge rose inexorably. The bridge had been built five years before using convict labour under the supervision of Henry Fancourt White, of White’s Road fame. Finally the pressure was too much for it. A great proportion of it collapsed and was swept into the sea. Shortly afterwards, the remainder of the bridge and portion of the causeway followed it. A cargo of teakwood logs which had been loaded into the beach was also swept out into the sea. A newspaper report commended the efforts of Capt. Wilson, of the Port Elizabeth Boating Company, Mr. Thorogood of the Algoa Watering Company, and a Mr. Kemsley, for their successful efforts in securing the floating wooden part of the bridge to the breakwater and thus preventing it from wrecking havoc among the small boats in the Bay. Enterprising boatmen soon engaged in a brisk trade ferrying passengers across the river. A special meeting of the Municipal Commissioners was called to address the criticism of the method of the construction of the bridge. At issue was the fact that the bridge’s foundation had been laid on shingle, when for several extra feet, it could have been laid on solid rock. Apart from this, a general opinion was articulated that it was preferable to erect a sturdy iron bridge. Even though the newspaper accounts do not provide details of damage in other parts of the town, one can imagine that with all the roads unpaved, there would have sustained damage especially those that were formerly kloofs. The next great storm was also in November but ten years later in 1867. Surprisingly, the initial part of the disaster occurred offshore when the steam tug, the St. Croix, broke her anchor cable and began to drift towards the shore. The solitary sailor on board had the presence of mind to hang out a distress signal. On spotting the signal, another tug, The Sailor’s Friend, went to the St Croix’s assistance. It took the dangerous manoeuvring by the Sailor’s Friend to get a warp aboard the St Croix before she reached the breakers. It then had the unenviable task of performing some smart clawing off to avoid getting into the breakers herself. If prizes could be awarded for the person surviving the most mishaps on the 19th November 1867, it would be presented to the “solitary sailor.” For second time he was in the midst of potential disaster. A lifeboat was sent out to rescue this lone sailor. On the way back the lifeboat was almost wiped out by a runaway Union Cargo boat that was broken loose from its moorings. The cargo boat slammed into the seawall. What saved the boat was three intrepid sailors who jumped aboard and secured her to the wall. Another cargo boat belonging to the Algoa Bay Company, also broke loose and drifted ashore. Maybe it was ashore where the greatest drama was playing out with South End auditioning for both the leading male and female roles. Most of the water was channelled down Rudolph Street. Initially this created a small water course but ultimately it expanded into a huge gully, collapsing first some of the fences and then later even some of the verandahs themselves. At this point the water channel in the road was twenty feet wide and between eight to twelve feet deep in places. By the time the rain ceased, twenty houses had also been undermined and collapsed. Infrastructure can always be repaired or rebuilt but human life can never be. The drama of the residents of South End knew no bounds. Some like a young girl, named Harvey, would pay the ultimate price. In an attempt to seek help, she ran out of her house and was immediately swept away by the force of the raging torrent. Born down on a swirling mass of water, her lifeless body was found buried in sand against the harbour bridge. 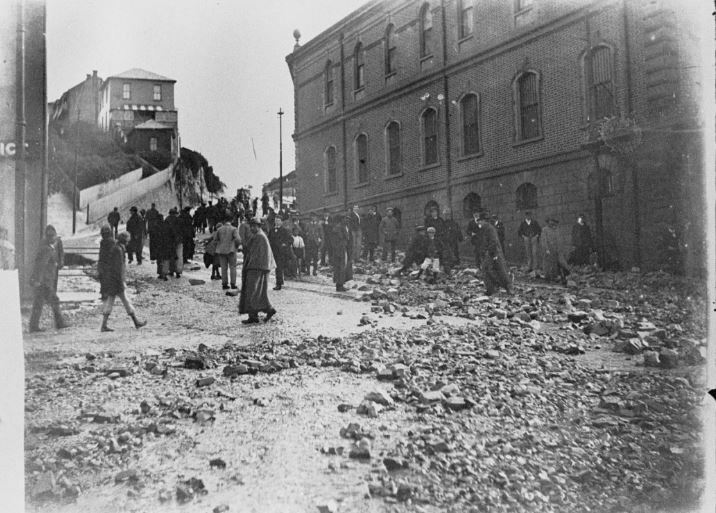 part from South End, the whole of central Port Elizabeth was comprehensively affected in some way. Other streets also suffered severe damage. South Union Street had craters six to eight feet deep. 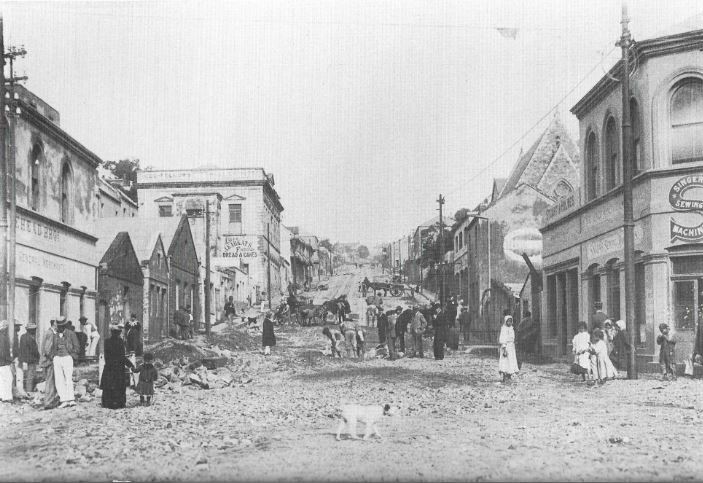 The surfaces of all the steep roads up to the Hill such as Military Road, Donkin Street et al, were all scoured to their bedrock. 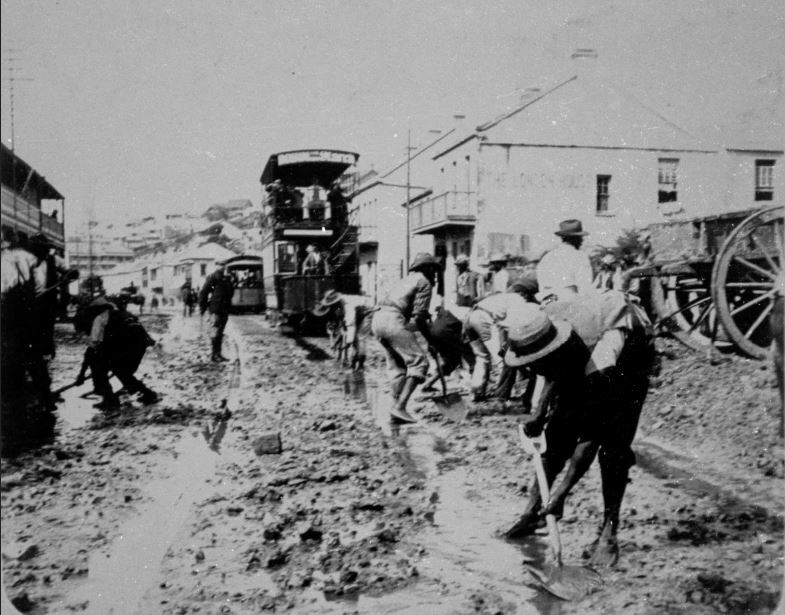 All of the soil “excavated” by the rain was deposited in Main Street and Market Square. 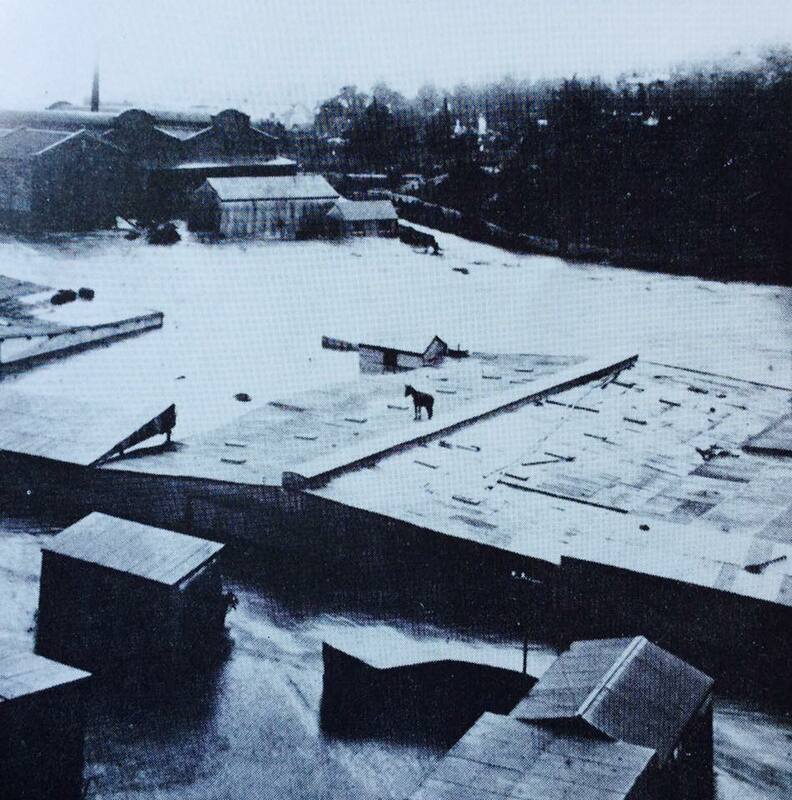 Severely affected were all of the shops, hotels and houses in Main Street which had their ground floors flooded. Even the vaults of the Port Elizabeth Bank were flooded. The southern buttress of the Baakens Bridge collapsed but the rest of the new structure stood. Several small craft sank at their moorings besides the breakwater. Frame’s Dam on Shark River, which at that time supplied water to the nascent town, was partially damaged and nearly all the gas mains on the Hill were cut. By dint of hard work, and energetic measures implemented by the manager, the gasworks itself suffered no damage. The reports as regards the rain’s duration and the volume fallen varies but both are within similar bounds: between half an hour vs one and half hour in duration and between 3½ and 4½ inches of rain. Whatever it was, it deluge was of exceeding short duration but high volume. Unlike the prior floods when saturated ground could no longer absorb anymore moisture, here it was a case of too much water too quickly. Without paved roads, all the sloping roads on the Hill were once again scoured to their bedrock. Tramways lines were obliterated and the railway line between North End station and the terminus was washed away. All work at the port stopped due to stormy seas. The retaining wall of St Patrick’s Road collapsed onto the houses below in Queen Street resulting in several occupants being injured. The Phoenix Hotel on the far side of Market Square was flooded, but in a defiant gesture, the diners continued their lunch with their feet on chairs, while waiters performed their duties by splashed about, ankle deep in water. 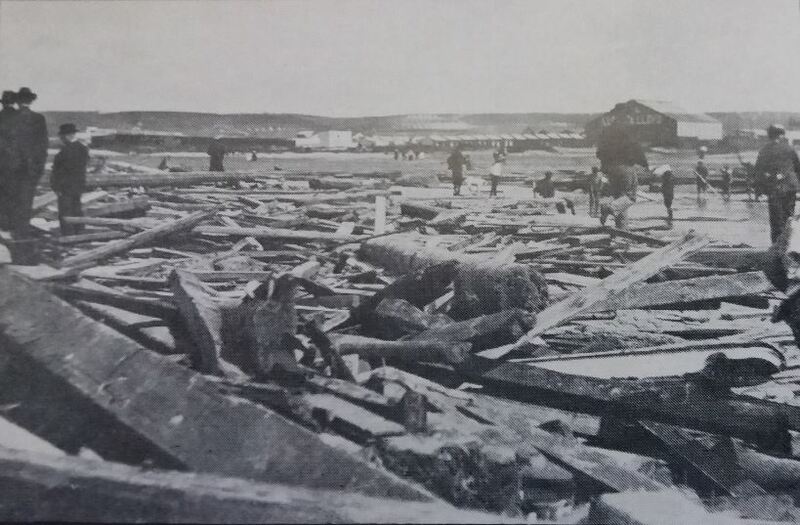 Wool stores on Baakens and South Union Street were damaged, and a boat yard was swept away. Newsome’s store on the North bank of the Baakens River was demolished and bales of mohair as well as hides and skins floated out to sea. Anderson’s sweet factory in the Valley was swept away when two fierce streams, one from Upper Valley Road and another from Brickmaker’s Kloof coalesced. The wall around St. Mary’s cemetery collapsed and part of the Malay burial ground was swept away. Target Kloof Road was cut, and further away, the main pipe leading from the Van Staden’s Dam was severed by a rock fall. Cooper’s Kloof was best described as a scene of desolation. Some property owners launched actions against the Municipality on the basis that they should not have filled in the lagoon and channelled the river into a narrow waterway. They were unsuccessful in their bid. After an interlude of eleven years, the beleaguered residents of Port Elizabeth were aware of the dangers of excessive rainfall. 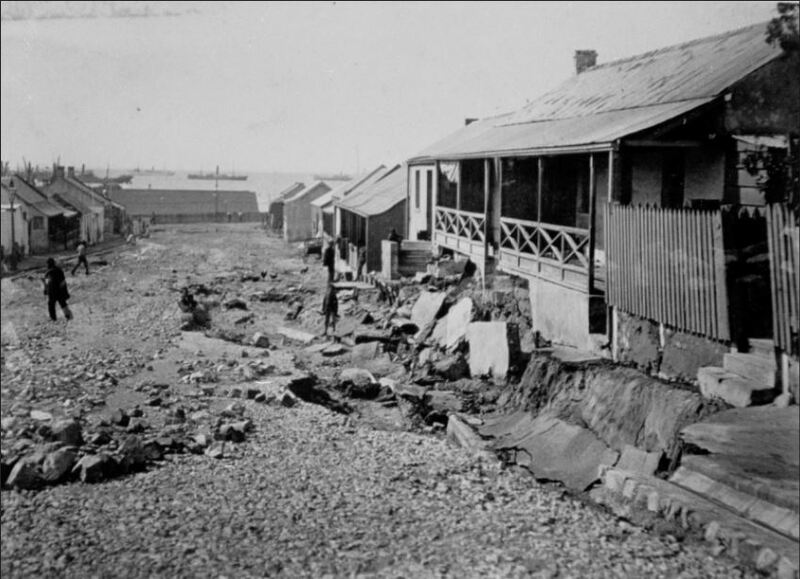 Known by the sobriquet, the Great Flood, this cloudburst occurred on the 16th November 1908 in the Hunter’s Retreat area. Like the previous floods, the cloudburst bore all the hallmarks of previous such events. The clouds built up over an area and were unable to disperse until they had discharged all their moisture. As the cloudburst was outside the town, unlike previous floods, the town itself was spared damage. Naturally the lower reaches of the Baakens River bore the brunt of the damage. The river rose rapidly, overflowing its banks and rushing through the buildings on the banks until they were submerged or demolished. The water continued to rise until it was over the bridge, but this time it was otherwise not damaged or affected. At the height of the flood, was bridge was ten feet under water. The flood rushed on, two hundred feet wide. 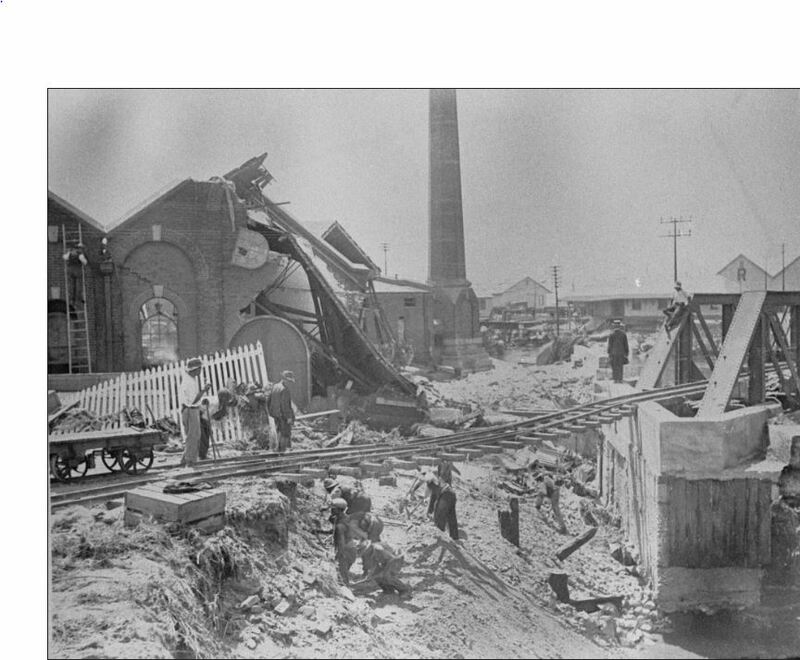 The railway sheds collapsed, and wagons were tossed about like toys. The Municipal stables went early on but all the animals were rescued except one unfortunate mule which was swept away but found footing on an iron roof. It stood there shivering, as bales of produce floated along like corks. At the mouth, the river broadened out until it covered North Union Street as well as the lower ends of Fleming and Jetty Streets. All buildings in this area were flooded and the Customs House was cut off so that the officials had to be rescued by lifelines. The gasworks was flooded and put out of action as were the electric power stations of the Tramway Company and Harbour Board. As some of the downpour flowed down the other side of the watershed, the Cradock Place area was also affected. It also culminated in the railway bridge over the creek being washed away. In his article, Mr. A. Porter covers the resulting court cases in some detail. “Two merchants, Frederick Samuel Tilbrook and Francis Carr Bayly, brought actions against the Town Council and the Commissioner of Public Works for losses suffered by them. Their case was that the action of the Town Council in filling in the lagoon above the bridge, and that of the railway authorities by reclaiming land around the mouth of the river, destroyed the natural outlet for flood waters. Moreover, it was alleged that the Town Council was at fault in allowing stores to be built along the north side of the river, as it should have known that such buildings would be liable to be destroyed by floods. Further, it was alleged, that the Baakens River bridge and the Harbour Board bridge were built in such a manner as not to allow floodwater through freely. However, Engineers, proved that during a normal flood about one and a half million gallons of water could be expected to flow through the bridges, which was capable of taking almost four million gallons per minute! At the height of the flood, nine million gallons per minute were flowing through and this could not reasonably have been foreseen. Moreover, the debris which blocked the bridges and caused a build-up, had come from buildings beyond the limits of the former lagoon, and therefore the Town Council could not be held responsible.